Francesco Vitale at Nauta Yachts tells me the owner of the 26.68m sailing yacht Serena is determined to sell, authorising a drop of €520,000, over 50%. 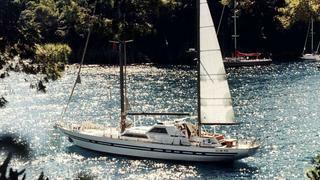 Serena was built by Benetti Sail Division in 1983 to a design by Laurent Giles and is RINA classed. This superyacht sleeps up to eight guests including a full width owner’s suite with a study that easily converts to a double cabin, plus two further guest cabins. The crew accommodation is entirely separate with a separate entrance. Formerly marketed at €990,000, Serena is now asking €470,000.